After indulging in all the baked goods and big holiday meals, I have been in pursuit of leafy greens in these January days. I saw a sign today at Whole Foods Market that says, “This year I want to eat more plants”. I like that goal. I love goal-setting in January- I think I might add this one to my list. I like salad, though I typically prefer it at a restaurant rather than at home. There are several salads at restaurants that I really, really like. I actually crave them. I think the difference in salads at home and at restaurants is the dressing. I am always trying to de-code dressings when I am out to eat- trying to discern ingredients, seasonings, methods so I can come home and try to re-create them. Do you ever make homemade dressing? They are cheaper, fresher, preservative-less, made-to-your-liking, and lighter (if you wish). I have found some of my favorites in Everyday Food Magazines. I find homemade dressing makes a significant difference in my feelings about salad. My favorite green salads are Greek and ones with fruit and nuts on them. In the summer I make strawberry and mango salads all the time, and in the fall and winter I top my green salad with slices of fresh pear and dried cranberries. 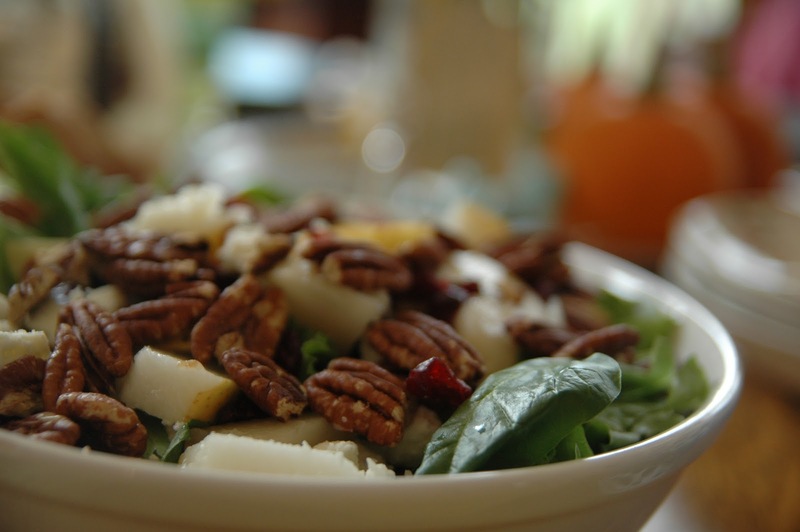 The ONLY thing challenging about this salad is toasting the nuts. I burn them frequently! Do you have this issue when you toast nuts? I stick them in the toaster oven and it seems like they are raw until the 5 seconds that they burn! So, you must watch them very closely. I must say they are worth it though- so buttery and crunchy. YUM! 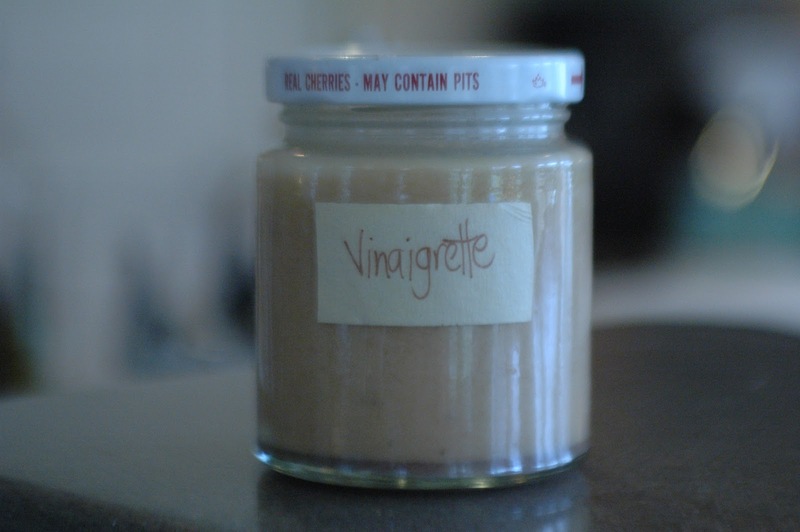 I’ve included two of my favorite Vinaigrettes. Take your pick- one is balsamic vinaigrette, the other a sweet vinaigrette. I love them both…OR get creative! Basically if you have oil and vinegar (or lemon juice) and seasoning, you have the basics for a dressing. You can add sugar or honey for sweetness; herbs: rosemary, basil, cilantro; garlic, salt and pepper for flavor. You can use balsamic vinegar, apple cider or flavored vinegar. Play around and make it to your liking. My friend Rich was telling me last week that lately he has been making a lemon dressing by whisking up the juice and zest of a lemon, olive oil, salt and pepper. I tried it yesterday and it was a tasty, zippy, quick dressing! 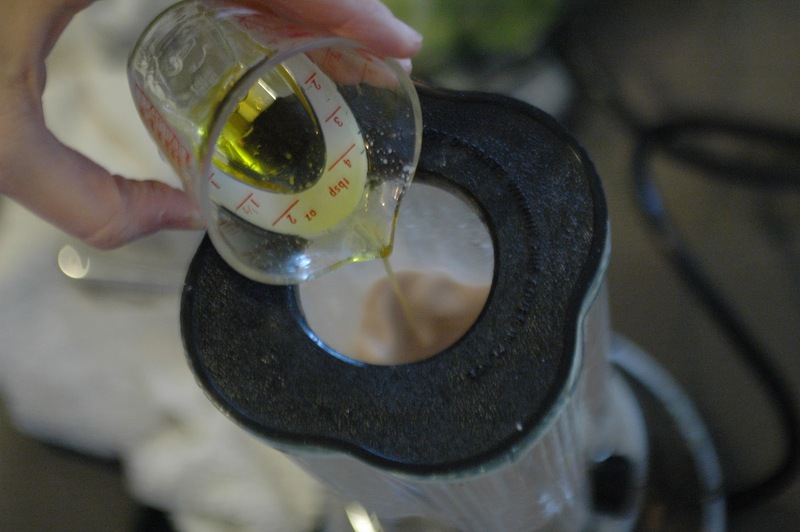 What are your favorite homemade dressings? Pour all of the ingredients (except for oil) into a blender and blend until smooth, then stream in the olive oil and blend until creamy. The blending creates a creamy, emulsified consistency. Pour all ingredients into a jar and shake well. Hi Julie! This is Lea Yerby (just in case I show up as healthprincess instead) and I recently stumbled along your blog and I enjoy it! I toast my pecans in a small skillet on the stove with the eye somewhere between low and medium because that's how I saw Martha do it on her show. I've only burned them once that way. I think it gives you a little more control. It might take a smidge longer, I'm unsure. Hope this helps! Krisit and Lea hello and thanks for suggestions about stove-top toasting. A good word. I have done this some and it is a good solution- it seems like it takes longer…waiting for them to toast but much more control. In the long run a better option I would imagine. I think I always hope for a hands-off, throw-them-in-the-toaster-while-I-fix-the-rest-of-the-salad, kind of method but that is unreasonable I admit 🙂 I do, however, use the skillet when I make candied pecans or almonds for a special salad…the sugar liquifies and coats the nuts. YUM! I also like sliced apples (Granny Smith or Fuji) with feta and nuts. For one reason, they keep well in the frig, so are readily available. I cut them a little crazy. First, I quarter the apple and core it. Then I cut each quarter “across” instead of full-length. That way, the pieces are “bite-size”–you know, for my tiny mouth! Ha! julie – you just described my favorite salad! Thanks for this post! I need to be inspired to make more salads-I feel like salad is always better out or when someone else makes it. I want to try the one with mustard-I'm so glad you love Nance's as much as I do! It's the best of sweet and tangy with a kick! My Grandmother discovered it and now that she lives in Kentucky, she has me buy it for her at Publix (which is the only place here I can find it). Have you seen it anywhere else? Melissa, I haven't found Nance's mustard anywhere but Publix, but I haven't searched beyond my nearby stores. I bet speciality food markets would carry it. Hooray for inspiration to eat more leafy greens! This salad and the sweet vinaigrette is my ultimate pregnancy craving right now. The tangy, tart, and sweet combo just hits the spot. SO GOOD!